An AT Solution that is Large Enough to See! Over the past few months, several people have contacted IPAT because they recently lost the majority of their hearing due to accident or illness and were looking for a way to communicate with others. They all spoke very well; however, they could no longer understand speech, did not benefit from amplification, had not learned to lip read, and did not know sign language. Most people reported that communication went too slow when typing or writing was used, or they could not interpret their partner’s handwriting. One person in particular also had very poor vision, which made the situation even more difficult. 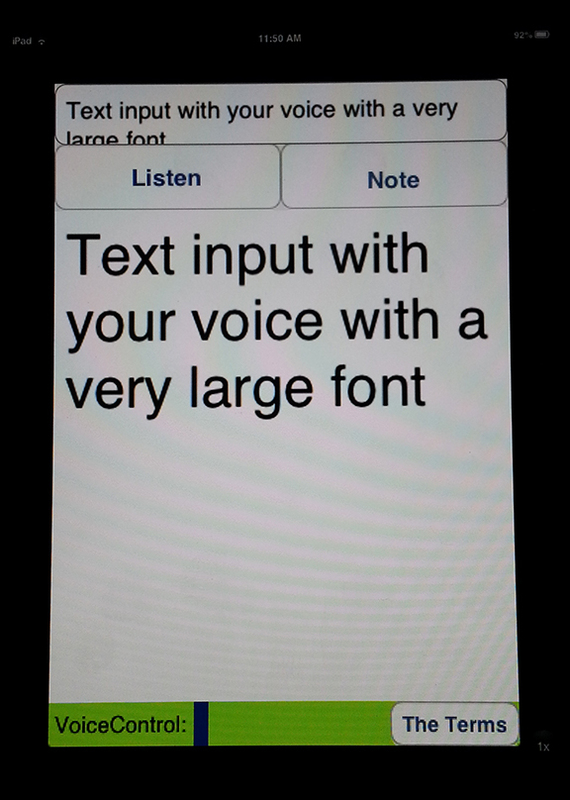 The family of this person owned an iPhone and had already tried solutions which involved the speaker dictating with the free built-in speech recognition engine or a free third-party app such as Dragon Dictate and found it fast but way too small for the person with vision/hearing loss to read. They reported that they could not find a way to make the text bigger within the app, which is when they contacted IPAT. The following are the 3 solutions that were suggested. 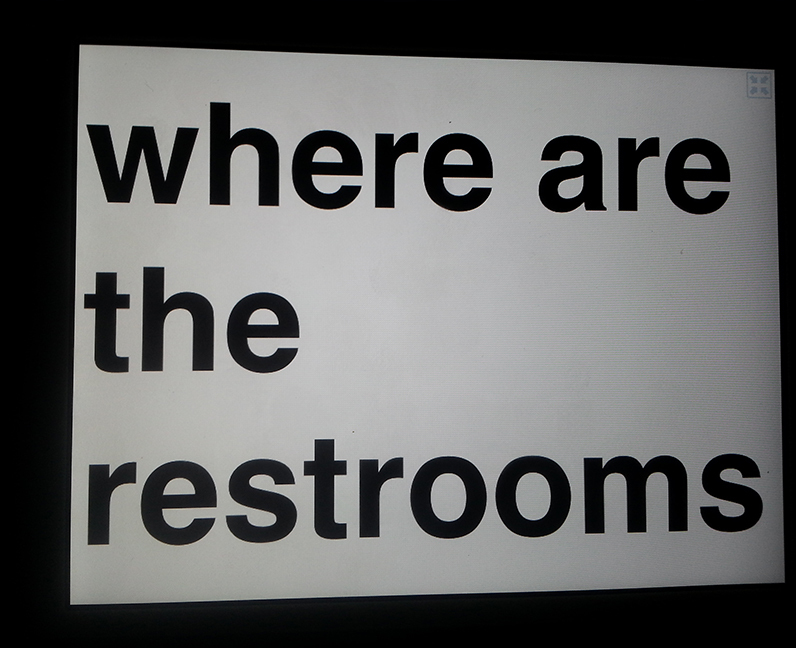 They are presented in order of font size. The pictures are of the same mini iPad, taken from the same distance, to give you some perspective regarding size. Please note that all communication solutions require an Internet connection-WiFi or 4G at present; however, there is rumor that this could change in the next operating system upgrade. The default font of this basic note writing app is pretty small. 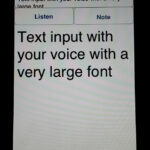 To remedy that, you will need to go into the accessibility features on your iOS device and change the font size. This will provide larger text than the default size, up to 56pt. To do this go to Settings>General>scroll down to Accessibility>switch on “Large Text”>touch the desired font size. 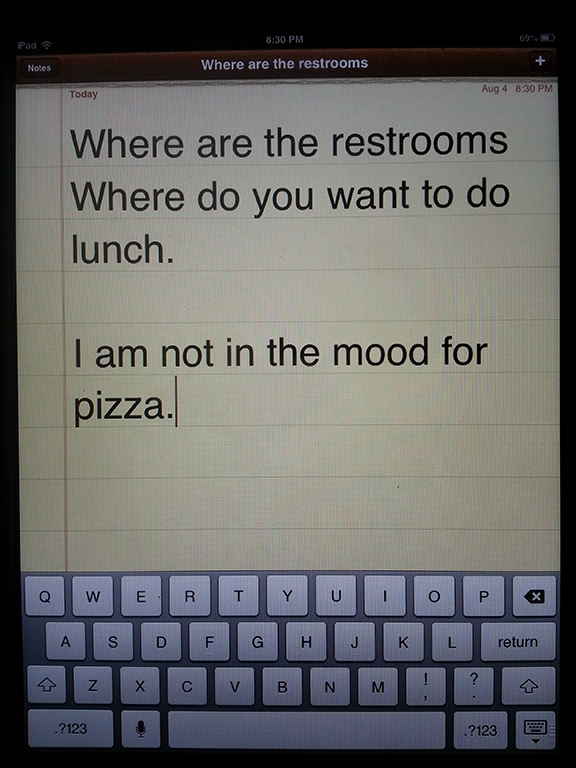 After this is enabled, open up the Notes app and dictate by tapping the microphone on the keyboard. This app has the ability to store all of the messages and to put them into folders for later use, which might be an advantage for some. Note, Listen Deaf-iOS $3.99–This app was designed exactly for this purpose-allowing a person to communicate with a person with hearing loss. One simply pushes the Listen button, speaks, and it is translated into a nice large font. However, you can only use it 20 times per day. After that you will need to tap in the text window to pull up the keyboard, tap the microphone, speak, and then tap the “note” button for it to change it into a large font. The developers say the program will function this way until they raise enough dollars to pay for the rights to use the voice recognition. Despite this issue, I still found it a very clean, easy, and fast interface for tech and non-tech users. I liked the fact that it automatically deleted the phrase as you entered the next one and that the text was very large, but there was still room for a good-sized sentence. I would suggest teaching unfamiliar communication partners to just use the microphone in the keyboard rather than having to re-explain the directions once the “listen” button stops working. Google Translate-Free-This app offers the largest text of all of the apps I investigated. Originally designed to aid those in translating other languages,it works very well for this purpose. You simply set both languages to English and tap the microphone to begin speech recognition. The first output is easy to read for many, but you hit the full screen button and you get the size you see in the picture-giant. Although this size may be necessary for some needs, it may be too large when you have longer sentences. If these issues apply to you or someone you know, give these apps a try, and let me know what you think. In the latest version 1.2 update of Note, Listen-Deaf-you can now have unlimited Speech to Text.